Longer functional life and sturdy construction are some of the attributes of our Bangle & Ring Making Machine (FX 2 TMC SPC). We are counted among the top Manufacturers, Exporters and Suppliers of Bangle & Ring Making Machine. The manufacturing of our machine is done using highly advanced techniques under the supervision of experts. Our machine is subjected to stringent quality tests prior to its final dispatch. The spindle is equipped with ceramic bearing of very high precision accuracies. The Spindle has a maximum of 50, 000 RPM. The spindle is coupled with variable AC drive which gives flexibility to change the speed as per design requirements. The CNC controller is compatible with leading CAD/CAM software available in the market. The programs are generated in (G) codes and (M) codes. The program can also be generated manually. 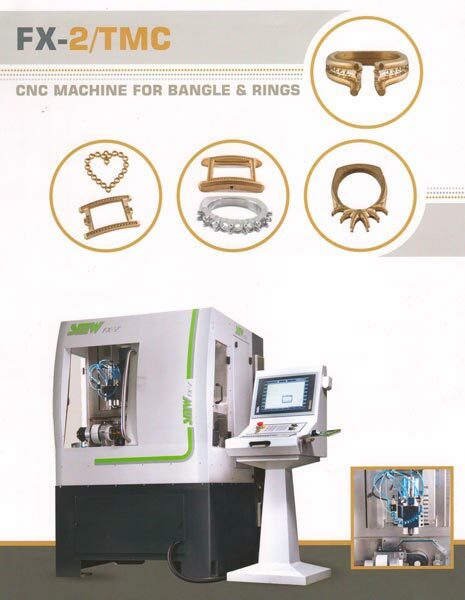 Centering system : Laser auto-centering system for centering bangles. Automatic Z-Pesetter for tool length.